"Wonder" is an inspirational movie which has kindness as its main theme, which director Stephen Chbosky made sure the cast and crew were at all times during filming. Chbosky, who wrote the book and screenplay as well as directing "The Perks of Being a Wallflower," has experience bringing to life characters who are sensitive, emotional and who don't always fit in. "I don't know how I got into this – making movies for or about young people," Chbosky said. "I'm very grateful that I get to do it and that I'm given the opportunity to do it." Trying to not only make a film about kindness, but purposefully making a decision to be kind while doing it became something much more than Chbosky could have imagined. The film inspired the cast and crew in more ways than expected. "The most remarkable thing about making the film, for me, was I decided to do it very purposefully from a place of kindness," Chbosky said. "I said to the crew, 'we're not going to yell, we are going to be kind not only when the kids are there but even when the kids are gone, we are going to be the same way, there will be no yelling.'" 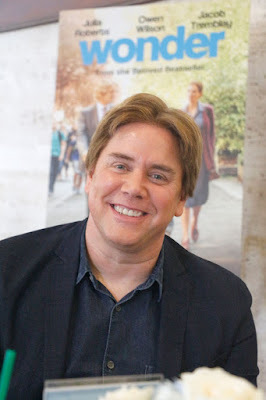 With two movies that impact young people at times when they can feel confused, lost and in need of hope, Chbosky has successfully delivered works of art that inspire. Charlie from "Perks" and Auggie from "Wonder" have an age difference, but are similar in many ways and Chbosky thinks the differences are small. "I don't see much of a difference between 'Perks' and 'Wonder,' it would surprise you how little difference I see between them," Chbowsky said. "One is for much younger people and is about subjects, that I think, are just as important as anything I tackled with 'Perks,' that affect people's day in and day out lives. I love working with kids." For many filmmakers, working with kids can be a daunting, difficult task, but Chbosky has learned that he has an affinity to sending a message for young kids. "I love how kids collect favorites – they collect a favorite movie or a favorite band or this or that and the other – its important because its helping them identify who they want to be, what their dreams may be, where they're going to live and what they're going to study and all these things, how they are going to impact the world." Chbosky has heard of kids who have seen "Wonder' and come out with the idea that they can do anything they set their minds to, which he believes is humbling. Reaching an audience in a meaningful way is the goal of any director and Chbosky is happy to get the opportunity to do so with fantastic stories.